Read Green Bay Press Gazette news feature on Old Northwest Frontier Tours, August 2nd, 2015. 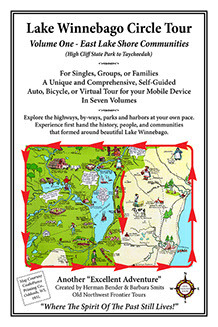 "Where the Spirit of the Past Still Lives"
This five minute video explains what our Lake Winnebago, WI, Circle Tour is all about and what you will see and do while using our illustrated epub tour books. It wraps everything up in one short, visual package that will hopefully answer all of your questions in an enjoyable way. This three minute video was created for the Nikon Video Contest in 2013 and tells a bit about the history of De Pere, WI, through its Riverwalk that overlooks the De Pere Fox River Locks and the De Pere rapids.